Uptown Aces casino is welcoming newly registered players to their brand new casino with multiple sign up bonus offers to choose from. In celebratory mood they are offering a limited-time $5 no deposit bonus code (UPTOWN5FREE) along with massive free cash incentives, starting with the multi-part $8888 slots sign-up bonus that can also be used on keno and scratch cards. Your very first deposit alone gives you the opportunity to earn 250% up to $2500! The remainder of the bonus is delivered over the next five consecutive deposits made as a returning player, with match deposit bonuses that are redeemable with the corresponding coupon code. Table game players needn't feel left out as there is also an exclusive table game sign up bonus that tellies up to $1500 in total, which includes a first deposit bonus of 150% up to $750. Use the relevant coupon code to instantly receive your free casino chips and try your luck at the tables or on any video poker game. 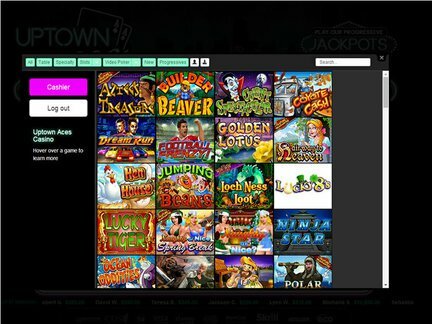 Uptown Aces casino accepts registrations from the US. Players in America can sign up either at the online casino, or from a supported mobile device from anywhere within the country. Uptown Aces also accepts players from other countries that have limitations on online gambling such as South Africa. They are however an international casino with a global player-base. RealTime Gaming hosts an incredible variety of high quality casino games with more than 150 slots and table games available to test with the Uptown Aces no deposit casino bonus. The entire collection is available at Uptown Aces download and instant play casino, with the mobile casino rendition offering a select menu of the best RTG inventions. Some of the most popular slots include Caesars Empire, Crystal Waters, Enchanted Garden, Aladdin's Gold and The Three Stooges, all of which is accessible on iPhone, iPad, iPod Touch 5th Generation and on various Android devices such as Google Nexus and Samsung Galaxy mobile phones and tablets. With the brand only one week old at the time of this review, there weren't many winners to list off. Allegedly, there have been two winners of $10K or more in the first week - Michelle S. and Sebastien S. The rest of the winners are in the hundred dollar range. As a new brand in the USA, there aren't any complaints to report at this point, but we'll update this space if we encounter any issues in the future. Personally, I was impressed that there an Uptown Aces mobile casino was included in the launch, so I believe the group has done a good job to avoid any complaints coming out of the starting gate. Uptown Aces casino has come back with a bang with a fully-rebranded and re-vamped site that just opened its' virtual doors to accept new registrations globally. The RealTime Gaming casino is however no newcomer to scene... Uptown Aces was previously known as Desert Knights casino and with existing knowledge and expertise in the online gambling industry the founders went back to the drawing board with the aim to create something that is new, fresh, exiting and much more rewarding. Knowing what works and fusing that knowledge with the latest technology has resulted in Uptown Aces online and mobile casino becoming at least a 3-star rated gambling establishment - which in the US market, where the quality of software providers is weak to say the least, means this is a 4-star rated brand for American players. Fun and games aside, the very foundation that the new casino was built on also ensures safe and secure online gambling and banking using a variety of methods, including Bitcoin, Bitcoin Cash, and Litecoin. Various stringent security protocols along with 128-bit SSL data encryption technology protects all player identity data and financial particulars as it is passed over the internet. Uptown Aces casino is also fully licensed and regulated by the government of the Netherlands Antilles. It is evident that a lot of thought went into the design and development of the new casino. The software functionality is superb and the layout allows players to easily navigate their way around. The mobile casino was optimized to work flawlessly on any supported handheld with large HD images and controls that make gaming on the small-screen effortless. With a $5 Uptown Casino no deposit bonus, plus a slots bonus of $8888 and a separate table game bonus worth $1500, we suggest that you register to take full advantage of the launch offers now! From start to finish, Uptown Aces casino fulfils the requirements for a high ranking casino in the US market, so they deserve a 4 star rating.